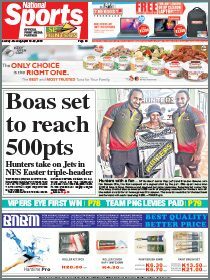 THE NSL final tomorrow at Port Moresby’s Lloyd Robson Oval is expected to be the closest decider in the competition’s nine-year history. And for Muta brothers, David and Cyril, there will be no love lost between when they don their respective team colours. Midfielder David will captain Hekari while younger sibling Cyril will defend for Star. The brothers have been key men for their clubs during the NSL season. During the pre-final press conference, David said playing against Cyril would be a challenge but he would treat him like another opponent. Cyril, a former Hekari player, parted company with the champions last year for Star. He said there was no special plan to contain David and keep the Hekari offence at bay. “I have to play well for Star and I can’t let the family angle and former teammates distract me,” Cyril said. Opposing coaches, Star’s Eddie Omokirio and Hekari’s Jerry Allen, both expressed confidence. 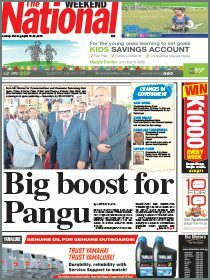 Omokirio, who was introduced to PNG football by Hekari, said there were no concerns with Star’s preparation. He said the players were just happy to make the final against Hekari. He assured fans the final would be a thriller and his club wanted nothing less than a win. Allen said he was taking a completely new team to defend the title owing to a raft of injuries and unavailability on compassionate grounds for several key players. “We lost strikers Kema Jack and Osea Vakatalesau through injuries while Abraham Iniga and Tuimasi Manuca had family commitments. “But we’re confident their replacements are ready to take on Star,” he said. Solomon Islander and Stars fullback Timothy Joe said he was excited to be part of the final after missing out last year. “It is a great feeling to be playing in a grand final,” Joe said. Fijian international and Hekari defender Alvin Singh said he was just proud to be playing in another final. The day will kick off with the inaugural National Women’s Soccer League final between Bara FC of Lae and University Inter FC of Port Moresby at 10am. The second match will see U 21 side Besta PNG United take on NBS Tukoko University in the third place playoff at 1pm.